The prefabricated wall is a milestone of the MEDICAL LAB SYSTEM. Modular, interchangeable, removable. It allows for quick and easy installation and inspection. The configuration of the wall, whether it has doors or not, whether it is blind/partly glazed, meets the requirements of solidity, modularity, accessibility and flexibility in compliance with the most stringent sanitary and thermal-comfort standards. STRUCTURE – The structure is entirely self-bearing so as not to create an impediment to the passing equipment above the false ceiling, such as air ducts, electrical cable trays. It is made up of vertical girders at modular centre distance from each other, running on upper and lower tracks, especially designed to insert coves and finishing profiles. 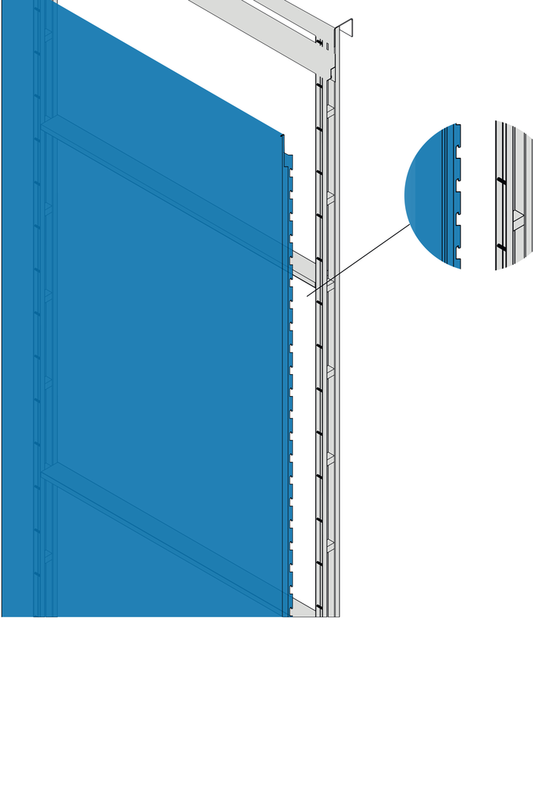 The vertical girders are engineered to allow for a “screw-less” installation of finishing panels and accessories. The structure is able to integrate RX shielding with the continuous inclusion of an adequately sized lead sheet. FINISHING – The curtain walls are made as single pieces up to a height of 3200mm and are made of different materials and finishing such as: HPL, steel or painted or PVC film-coated antibacterial stainless steel, glass and Solid Mineral Surface (Corian®) . The walls may also be customized by dye sublimation printing of high-definition images, upon the client’s discretion. The sealing is made up of removable and antibacterial silicon seal inserted between the gaps between panels.